Just recently, I have been very interested to KOrganizer, a calendar scheduling program from KDE. 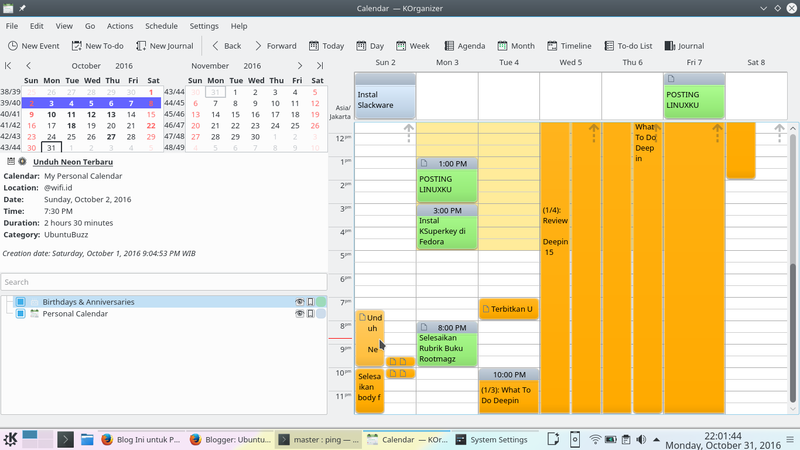 It is awesome in scheduling my personal tasks, it has calendar with categories and colors, and also it has reminders. 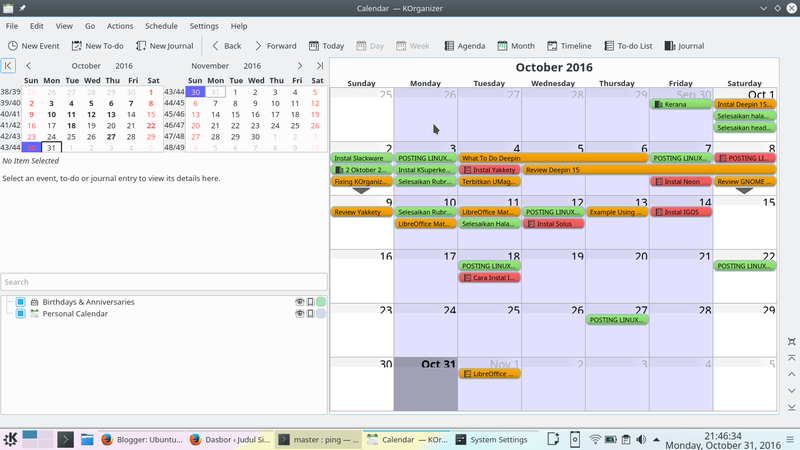 This article gives a personal example from my own calendar, with some little reviews, and you can use that calendar file and edit it to suit your needs. And I'd like to say big thanks to Azzam Syauqi Azis to inspire me about how awesome KOrganizer was. Enjoy! I am sorry if the language used in items in calendar is not English. You can edit them as you wish. However, the days language viewed is already in English. This default view of KOrganizer is the most interesting part of it. I can see my tasks/items in a whole month, this helps me managing my time a lot. And I love KOrganizer to have colors to help me distinct my jobs (by the way, I have 2 different jobs) easily, when I must work here and when I must work there. Every single item on my calendar can have some details. I can add date, begin time, due time, and any description I want there. Also, when I hover on one item, it shows a tooltip showing its details in an easy to see color scheme. For me, while truly I have a weakness in memorizing, it helps me a lot. 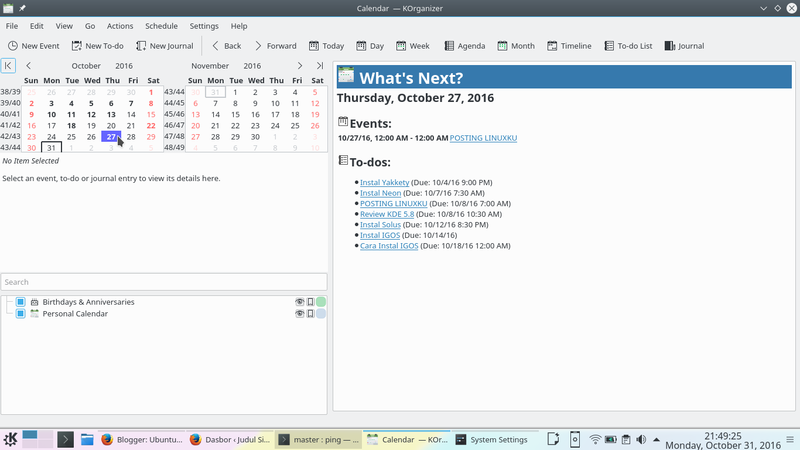 When I need the list view rather than calendar view, I use menu View > What's Next. 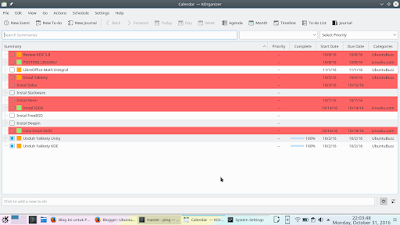 This shows me the calendar in a bullets list manner. I can tell myself, what to do in one day, two days, three days, or more, by clicking the date numbers from the left calendar table. See picture below. 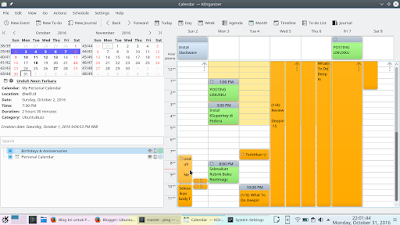 KOrganizer can also shows my schedules in vertical table per day, like this. Benefit of using this Agenda View is I can tell how long will a single item take. I can drag an item to move its time and resize it vertically to prolong the duration. I don't need to edit the numbers by typing, rather, just drag it and it's done. 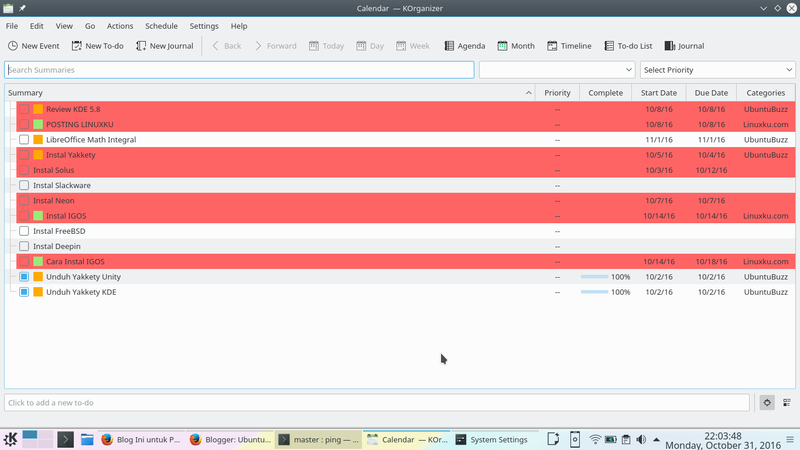 KOrganizer provides todo list facility, too. 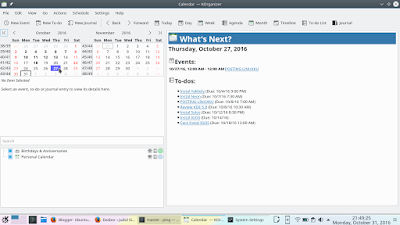 I can create a new todo, add begin and due time to it, place it at calendar, and wait KOrganizer to remind me right at the time. You can download my calendar, open it in KOrganizer and edit and share it as you wish. Download it directly https://archive.org/download/buzz-smallfiles/icalout.ics.